Riverside Court Cottage01606 891 691work Self-cateringRiverside Court Cottage – in the heart of historic Hereford. Available for short breaks, weekly or longer stays. If you would like your own special, cosy place in the heart of historic Hereford where there is ample space for you to explore, walk, cycle and simply relax, then stay at our high quality self-catering cottage and enjoy the great facilities waiting for you. Riverside Court Cottage has been carefully converted from a 1697 cider, sack and coal warehouse to provide a lovely holiday retreat for 3 guests. The cottage exudes character and warmth with many internal and external oak beams. Full gas central heating. Upstairs, there are two bedrooms, plus a spacious modern bathroom including a large whirlpool bath and power shower. The master bedroom has a splendid solid oak 4 poster bed which is a superb feature of the cottage. The fully fitted kitchen is very well equipped and includes: dishwasher, washing machine, fridge/freezer, gas hob and electric oven and microwave. There are ample functional utensils and also a butcher’s block. Along the hallway is our lounge with two large leather sofas and a dining area. Outside, the cottage shares a communal garden with superb views over the river, the Old Wye Bridge, the Left Bank complex, the cathedral and the Bishop’s Palace. Also, there is a table and chairs near the door for guest to use and a terrace at the end of the garden. We face the River Wye – named “the best fishing river in England”. Day permits are available. Welcome Pack with tea, coffee, sugar, milk and biscuits – the immediate essentials! Supply of quality cotton towels, tea cloths/towels, cleaning equipment, etc. Apart from the cathedral and ample city shopping, cafes, pubs, restaurants and markets being only 200m away over the old bridge, there are leisure opportunities within metres of the cottage. At the end of Wye Street are the King George V playing fields and Bishop’s Meadow with riverside walks, tennis, putting green and cycle hire. Within 100m you can book into the Halo sport and leisure complex with swimming pool, spa treatments, etc. within easy walking distance there are a range of supermarkets and small shops to add to the self-catering experience. Our aim is to make your holiday as easy and enjoyable as possible and our facilities, sense of history and great location are important features in providing this. Unfortunately, in consideration of future guests we are unable to accept pets. Also, we are a non-smoking house, however, you are free to smoke within the courtyard. 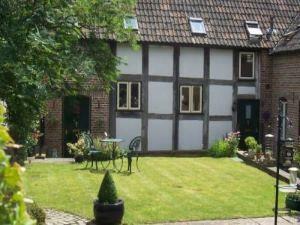 Riverside Court Cottage – in the heart of historic Hereford. Available for short breaks, weekly or longer stays. On the south bank of the River Wye, by the side of the old Wye Bridge.